Recommended. I read it all the way through in one evening.In short: Harry Potter meets the Arabian Nights. The main character is a girl, but boys play a strong role in this adventure as well.The story starts out with Ruby, whose mother wants her to grow up to be a normal person, despite the fact that she has an obviously magic purse and gets mail from her mother by having the wind blow it to her. But red-headed Ruby isn’t cut out for a normal life (some people aren’t), and when her mother forbids her from going up to the attic the same day that her grandmother tells her that her birthday present is up there…well, goodbye normal.I won’t be giving too much away if I say her birthday present strongly resembles the object in the title of the book.However, the first thing that Ruby does with said present, after being magically and wonderfully (and thirstily) transported to a mysterious country in the desert, is LOSE it. 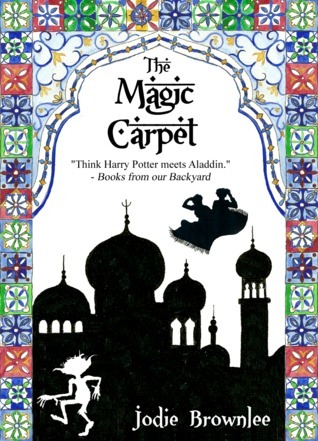 It’s not her fault–she had no idea that magic carpets were so picky–but it’s her job to get it back from the evil half-genie madman who stole it from her. I found this book a week or two ago when I was cleaning out a draw which I hadn't touched for at least 2 or 3 years. In it I found this book, one that I now remember loving when I was about 11 or 12, but hadn't read since then. Reading it now brought back so many memories that I had completely forgotten, so for that, I'm very grateful of it. My primary school favourite, second to the Sister's Grimm, reread. Another favourite series from my primary school years. Jodie Brownlee - I love adventure, mystery, well described settings and a plucky, smart protagonist. I am the author of the Ruby series, a fantasy trilogy for upper primary ages and older, published by (English) and Piemme (Italian).Ruby Rosemount and the Magic CarpetRuby Rosemount and the Traveller's TelescopeRuby Rosemount and the Doomsday Curse Ruby Rosemount and the Magic Carpet was nominated for the CBCA Book Awards, was Dymocks Critic's Choice and Angus and Robertsons book of the month. Ruby Rosemount and the Traveler's Telescope was nominated by young readers for the W.A. Young Readers Book Award.I wanted to be a genie when I grew up but soon discovered they could spend centuries locked in a bottle. I now write about them instead.When not writing about Ruby's adventures, I'm off having my own - riding camels in the Rajasthan desert, elephants in the rivers of Thailand, driving a tuk-tuk in Sri Lanka, dining in haunted castles, climbing active volcanoes in the Pacific, diving with sharks (though not intentionally), parachuting from old planes, visiting witch doctors in Africa, and exploring overgrown temples in Cambodia.I grew up in Australia, lived for some time in London (UK) and have now settled in Colorado with my husband and our adopted cat, Lola, where I am writing my fourth novel - a cozy mystery for young adults set in a dilapidated mansion in the mists of Maine.